ISIS video shows beheading of 21 Egyptian Christians. 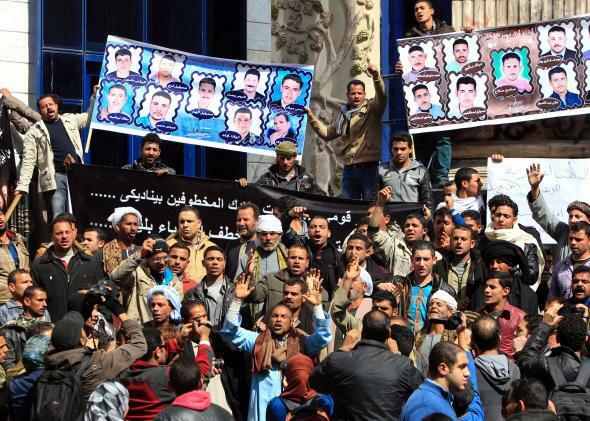 Relatives of 27 Egyptian Coptic Christian workers who were kidnapped in the Libyan city of Sirte, take part in a protest to call for their release, in Cairo, Feb. 13, 2015. ISIS militants have released a graphic video that seems to show the beading of 21 Coptic Christians in Libya. The video shows a group of captives wearing orange overalls being led to a beach. There they are forced to kneel and are then beheaded, reports Reuters. The high-quality video, which bears the logo of Al Hayat, the official publishing arm of the Islamic State, is in stark contrast to the footage released in the past by affiliates of the group. The footage in those videos was shaky and grainy, suggesting an amateur production. By contrast, the five-minute clip released Sunday is professional and cinematic, and is filmed in the same style as previous Islamic State videos, including one that showed the mass beheading of captured Syrian soldiers last year. Egypt has declared a seven-day mourning period, reports the Associated Press.